OK, here we go—a new year of life and a new avenue of service (diakonia), aka “ministry.” This is the first of many communications from me to you in regard to The Living Truth Fellowship, which is the name that a nucleus of several dozen saints thought best to describe the organization we are starting. Though there are no limits in Christ, the state of Indiana requires the “Ltd” designation. As I stated in my December 27 letter, you will receive these for-now-monthly newsletters unless you tell me to get lost, which I have often done. The name of our ministry contains an intentional double entendre. The Word of God is the truth (John 17:17), and because it contains the very life of God (Eph. 4:18), it is the living truth (John 6:63; Heb. 4:12). As such, the word “living” is an adjective. But God intends that His truth be practiced, that is, He wants us to make “living” a verb by being living epistles of His truth. In that sense, being “verbal” means more than just speaking the Word; it also means doing it. As you know, most of our beloved brethren in the Body of Christ are hampered by a lack of knowledge of the truth, for which there is no substitute, and without which, truth cannot precisely be lived. But 1 Timothy 2:4 tells us that God wants each Christian to come unto a thoroughly applied knowledge (epignosis) of the truth. Our Father desires that we put His truth in our “inner parts” (Ps. 51:6) so that we might not sin against Him (Ps. 119:11). At the bottom line, it is always against God (and the Lord Jesus) that we sin (Ps. 51:4), but of course it is always a human being who bears the brunt of our self-centered actions. God looks on the heart of each person, and He does not measure the quality of one’s life by how much Bible he knows, but by how much knowledge of the truth he practices in his relationships, that is, how much of the heart of God does he manifest. We can objectively measure the quality of our lives by the quality of our relationships with people (Mark 12:28-31; 1 John 4:20 and 21). Many Christians who know only a little biblical truth are faithfully practicing what they know, and the Lord will reward them for that. The Greek word for truth is aletheia, which means “that which is in accordance with fact or reality; that which actually is; that which is genuine and substantial; the revealed essence of something.” That is, transparency, or “what you see is what you get.” Biblically, the opposite of truthful living is “hypocrisy,” which means there is a disparity between one’s words and his actions. It is significant that several times in the KJV, a form of aletheia is translated “indeed,” showing that one’s deeds are to correspond with his words. In Greek, hupokritos means “wearing a mask” (see anupokritos in Rom. 12:9 [“without dissimulation”]; 1 Tim. 1:5 [“unfeigned”]; James 3:17 [“without hypocrisy”]—KJV). Our goal in The Living Truth Fellowship is to “GET REAL” with one another, and with all men. When we sign off, “Yours truly,” we want that to mean something. Jesus Christ is our supreme example. In John 17:17, he said: “your word is truth,” and he had exerted a lifelong effort to learn it, as evidenced in Luke 4 when, with a kind of bowling motion, he unrolled a very lengthy scroll that had no verse numbers or paragraphs and quickly found the place in Isaiah 61:1 and 2 that we today designate with only a comma! But Jesus also LIVED the truth so flawlessly that he could say, I AM the truth (John 14:6). In other words, he BE true. And those are the two sides of the coin of truth, if you will: doctrinal and practical, propositional and relational. Without both sides, that coin won’t spend, that is, people won’t “buy” what we have to offer. (15) Instead, speaking the truth [aletheuo] in love, we will in all things grow up into him who is the Head, that is, Christ. (16) From him the whole body, joined and held together by every supporting ligament, grows and builds itself up in love, as each part does its work. In the Greek text, the noun aletheia (truth) is made into a verb (aletheuo), and a more vivid rendering would be “truthing it,” that is, living the truth by being true to truth. It is significant that “truthing it” looks to be the only way to grow up in Christ, and it would follow that those not living the truth are not growing. In this new (ad)venture, we will do our best to be true to truth so that in our segment of the Body of Christ, verse 16 will be a living reality. (16) Have I now become your enemy by telling you the truth [aletheuo]? (17) Those people are zealous to win you over, but for no good. What they want is to alienate you from us, so that you may be zealous for them. Here we see that if you choose to be true to truth, you will be opposed by those who are not, and that often this will be due to their desire for power, control, and the praises of men. Of course, in conjunction with Satan’s tactic of attacking truth tellers and accusing them of doing exactly what he himself does (as when the Pharisees told Jesus that he was the one who had Beelzebub), such people will always turn things around on you in that same way. In the course of events these past few years, Elizabeth and I have identified a growing nucleus of brethren who have earned our trust, and who want to be involved in TLTF. These are people who love the Lord, love us, appreciate our joint ministry in the Body, and who will help us carry it out. Like we, they are determined to do it right. Biblically speaking, I don’t think that means I do it on my own. The book of Acts shows a plurality of elders who, when they did it right, worked together in truth and love, and we will do our best to follow that pattern. We will not only project an appearance of accountability, but also act accordingly. Our goal is to live the living truth. What form of church governance we adopt is relevant, but the real issue is the posture of a man’s heart toward God, and it must be available for one to stay true and honest in that regard. 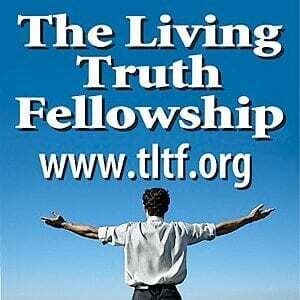 We are in the process of organizing TLTF so as to give those of us involved in leadership the least chance to go astray. Nothing is yet set in stone, but our tentative plan is to have five Trustees, none of whom will be on salary or have a vested interest in climbing a corporate ladder. That means that I as the president will not be a Trustee or have an official vote, though I will sit on the Board and be at all Board meetings. My input will be highly valued, but I will have to trust the Trustees as to the final say on important ministry matters. As an added layer of input and accountability, we plan to also have a group of Elders who will function as an advisory council to the Trustees. You can rest assured that none of those who will be Trustees of Elders have a problem disagreeing with me. Neither does Elizabeth, whose depth of godly character is something I hope you have the opportunity to personally experience. By the time I write to you next month, I hope to give you the names of our Trustees, Elders, and others working in some capacity. When I do, I will also give you the Commitment Statement to which we will hold one another accountable for the benefit of all we serve, so that we do not become hypocrites. We are already incorporated as a non-profit Indiana corporation, and we are working on our By-Laws. Perhaps by my next letter we will also have submitted our application for tax-exempt status. We do have some world class “websters” (I just made up that word) working on our forthcoming website where you will find our Mission Statement and Statement of Beliefs. We also have our own YouTube channel, and we will let you know when those are functional. We’ll be doing LOTS of new teachings on video, eventually including my three-hour overview of the administrations in Scripture and a new foundational class. Some excellent teachers have already offered their services to help with these projects. Spirit & Truth Fellowship has given me permission to reproduce all the work I did from 1988-2008, so our website will have all the audiotapes I’ve done, as well as all the articles I’ve written in The Sower magazine and all those on the STF websites. We also plan to make available via online publishing the books I helped to write. In particular, I want to add a key chapter to Don’t Blame God. But the seed on good soil stands for those with a noble and good heart, who hear the word, retain it, and by persevering produce a crop. You may know that for the past nine years I have been earning most of my living by teaching an SAT prep course to deranged “yutes” here in Indianapolis, and I am committed to that through this school year, ending in May. I love the teaching part because not only do I get to be totally insane for 12 hours, but what I teach also helps the kids crush this important test. If you add up all the days I teach, it’s only about five weeks a year (between mid-September and late May), and I’d like to continue doing that in order to earn extra income. What takes up most of my time is recruiting kids by phone, so I must find someone to do that if I am to get back to ministering on a full time basis. I’m about to put an ad in the paper, so please pray that the Lord sends me the right person.